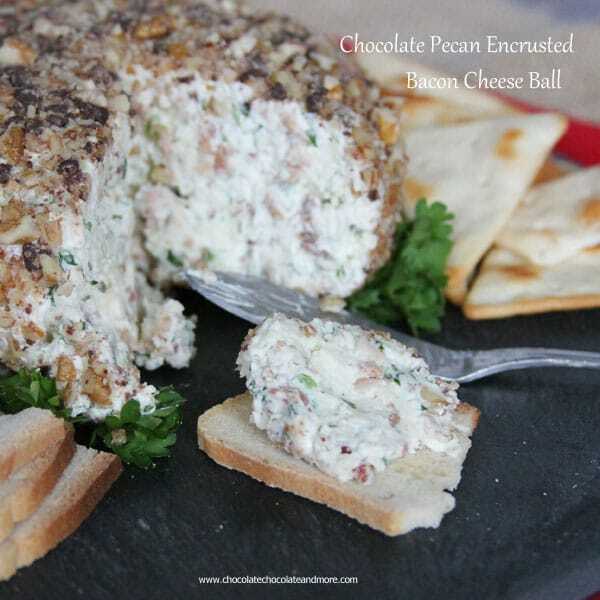 Chocolate Pecan Encrusted Bacon Cheese Ball - Chocolate Chocolate and More! 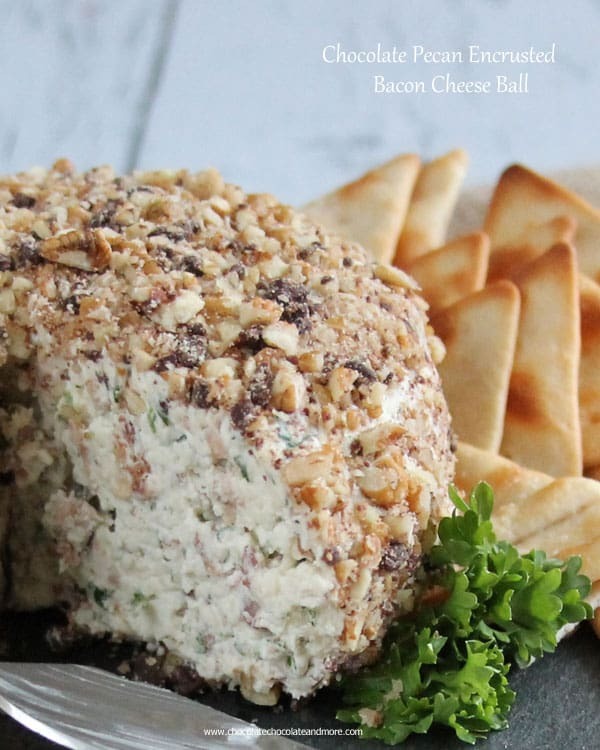 Chocolate Pecan Encrusted Bacon Cheese Ball-Jarlsberg cheese enhances the flavors of bacon, green onions and just a touch of blue cheese then coated in pecans and semi-sweet chocolate! We have a tradition at my house. 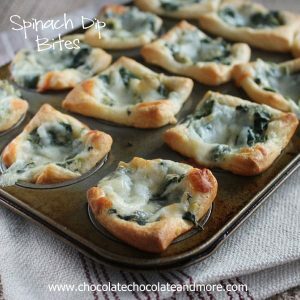 On Christmas eve, instead of sitting down to a big meal, we snack. We make our meal of appetizers. We do the little sausages in the grape jelly/barbecue sauce. We do some chicken wings. We do some Sausage balls. And we always do a cheese ball. 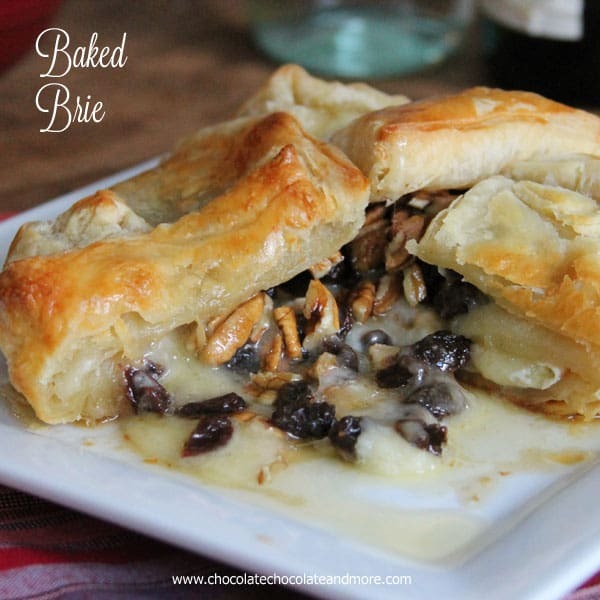 There’s just something inviting about a soft spreadable cheese covered in nuts. And the flavors are endless. The key is starting out with the best ingredients. You want fresh parsley, not the dried stuff. You want green onions, not the bag of yellow onions. Some good crisp, smoked bacon. And your cheese. After all, it is a cheese ball. Not just any cheese will do. 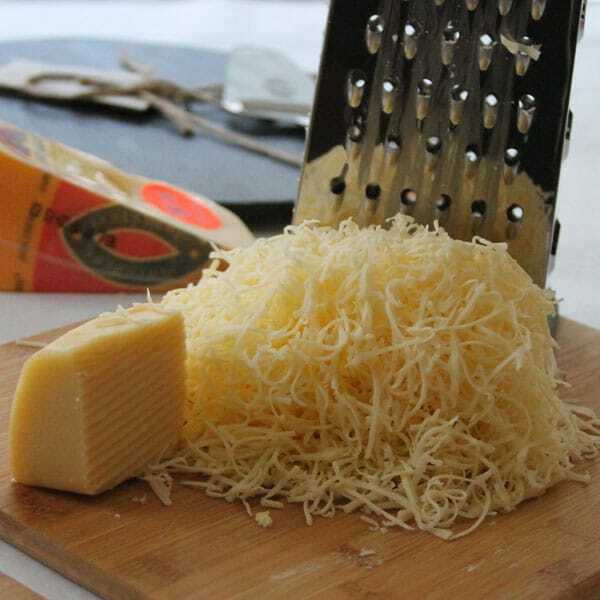 First off, you need to freshly shred your own cheese. That pre-shredded packaged stuff just isn’t going to cut it. (Pun intended.) It only takes a minute or two. And you want a good cheese, nothing overpowering but one with a good flavor. 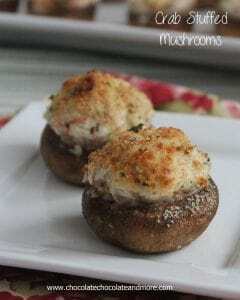 One that will blend well with everything else you choose to put in your cheese ball. Jarlsberg is that cheese. A slightly sweet, nutty flavor. It doesn’t overpower but you taste the creamy goodness in every bite. 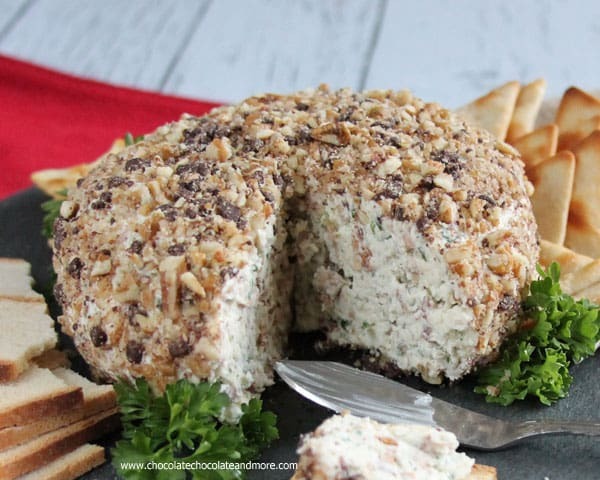 Combined with just a touch of blue cheese, this cheese ball is the only one you’ll ever want to make. And let’s chat about the chocolate. I know, cheese and chocolate? Don’t knock it until you’ve tried it. Just make sure you use a semi-sweet or dark chocolate. Using the mini chips just saved me a little time. O put them in my chopper when I chopped my nuts to make them a little smaller. I have to tell you. My daughter, the picky eater, got a sample of this cheese ball after I took the photos. She’s been bugging me ever since to eat the rest of it. Good thing I have enough Jarlsberg to make a second one. Not sure this one will make it to Christmas eve. In a large mixing bowl, cream together cream cheese and milk until smooth. Add in cheeses, onion, bacon and parsley. Mix until combined. Add salt and pepper to taste. Shape mixture into a ball and wrap tightly in plastic wrap. Place in freezer for 1-2 hours to firm up. Mix together chopped pecans and chocolate chips. Spread mixture in the bottom of a pie plate. Remove cheese ball from freezer, and unwrap. Roll cheese ball around in pecan mixture to coat, patting extra mixture into cheese ball with hands to cover any bald spots. 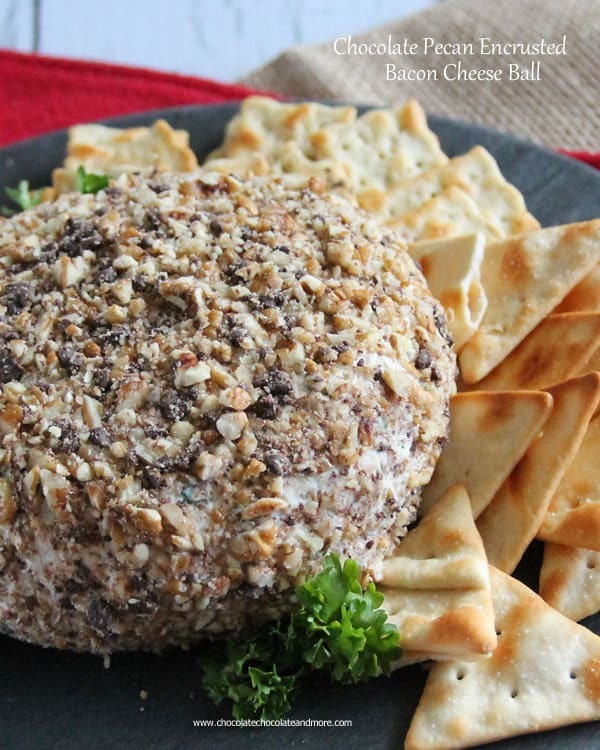 Rewrap cheese ball in plastic wrap and place in refrigerator until ready to serve. Serve with plain crackers or melba toast. This can be made up to a week ahead. Also delicious spread on celery stalks. Try switching out the cream cheese with Snofrisk if it's available in your area. I was compensated for this post by Jarlsberg but all opinions are my own. I only share things I truly love. I like the idea of snacking instead of collapsing from a giant meal. And a big ball of cheese is a happy sight. 🙂 Pinned. And thanks for including my link. We are the same way on New Year’s Eve – snacks instead of a real dinner. Cheese ball always, always make it. Even then I’m all for eating cheese ball all year round, especially with a glass of wine. Love how you used Jarlsberg because I do love eating their cheese.